Heat oven to 450°F. Remove pie crusts from pouches; place flat on work surface. With 4-inch round cutter, cut 5 rounds from each crust. Fit rounds over backs of ungreased muffin cups. Pinch 5 equally spaced pleats around side of each cup. Prick each generously with fork. Bake 9 to 13 minutes or until light golden brown. Cool completely, about 30 minutes. Remove from muffin cups. Meanwhile, in large bowl, gently mix fruit and strawberry glaze. Refrigerate until thoroughly chilled, about 30 minutes. 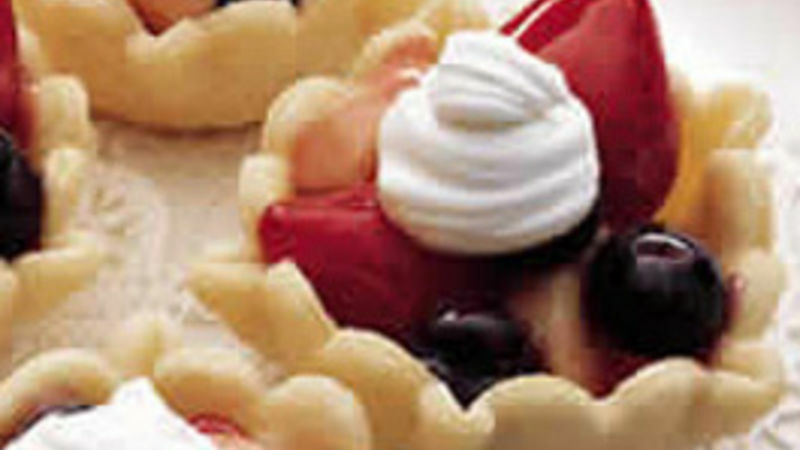 Just before serving, spoon 1/2 cup fruit mixture into each cooled tart shell. Top each with whipped topping.